04/04/2019 - The Nebrodi Mounts Black Pig Capocollo The definition of "Nebrodi Mounts Black Pig" describes a local race of pigs typical of the territories within the area of the Nebrodi Mounts in the north west Sicily. Judging from the fossils and the references written by ancient writers, the presence of the animal had been already confirmed during the greek period (7-6 century B.C), as a testimony of the immense heritage that is still nowadays safeguarded in these valleys. During the middle age its breeding decreased due to the religion of the new conquerers; another factor that determined its decline was the gradual disappearing of woods which previously covered most of the Sicilian territory. In the last years there has been a convinced reintroduction of the breeding of this specie, on which multiple studies have been made in order to give value to its productions. The Black Sicilian pig is now a officially recognized race and managed by the ANAS (National Association of the Farmers of Pigs) The Nebrodi Mounts black pig is black skinned, and it has strong black bristles that reach the length of 10cm almost, looking like a mane and reminding of a boar, it has small-middle size (60-65 cm average) The breeding system is "en plain air", that is to say that the Pig lives exclusively in the natural environment fed with barley and field beans to maintain the organoleptic qualities of its meat and all its natural genuiness. The Capocollo is taken from the neck of the Black pig and its meat is naturally very salty and perfumed, and it is worked by able masters with natural aromas. Aspect: Cylindric and lengthened shape Consistency: tender, compact Aspect after the cut: The slice is compact and its colour is red intense with some variable fat veins. Weight: between 1 and 1.8 kilograms. Smell and Taste: persistent and intense accompanied by the natural species and aromas. 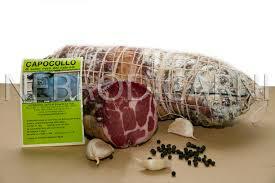 Curiosities: it is exclusively produced with black pig meats from Nebrodi Mounts. It takes its name from the nearest part to the head of the black pig.